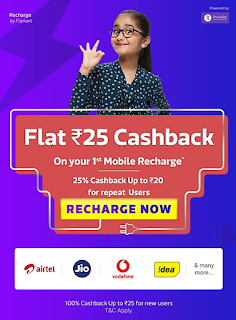 Flipkart Gives 100% Cashback on 1st Mobile Recharge. upto Rs.25 Recharge is free. 2- Install and open the Flipkart App. 3- Goto Menu >> Click on Recharge. 4- Now Give permission to Flipkart for fetching your Phonepe app data. 5- Now Initiate your first ever Prepaid recharge on flipkart. 2- Cashback credited to a user cannot be withdrawn to any linked bank account or transferred to other users. 4- Any cashback related queries should be raised within 30 days, post a successful transaction.